*this is a sponsored post for SheSpeaks/VTech. Opinions are mine. We live out in the boonies, literally. You have to drive up a huge, windy hill to get to our house. The first few times I went down that hill to the store, I threw up in the car.. ya, it is that windy! Scary! 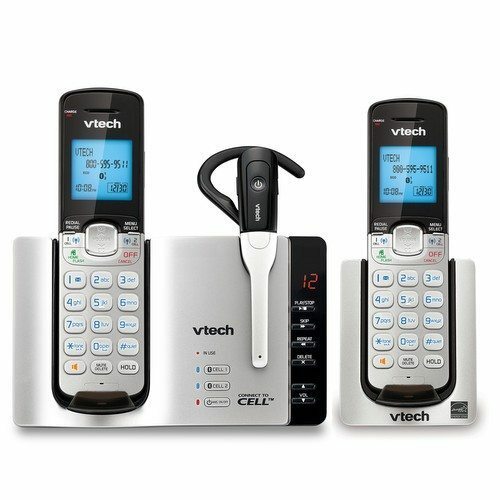 So when I was able to check out the VTech 2 Handset Connect To Cell Answering System with Cordless Headset, I was very excited!! Could this mean I could now not worry about cell reception where we live?? This was set up literally the same day we received it. I could not wait to give it a try!! There are so many wonderful features I wanted to try out on this phone. Download Phonebook From Cell: Store 2000 records from up to two different cell phones; no need to input names and numbers into your cordless phone system. Virtual Multi-Line Operation: Pair up to two cellular lines and one landline with your cordless system. Then, enjoy the freedom to make and receive calls on all three lines—all at once. Make and receive landline and cellular calls: Connect to BLUETOOTH®-enabled cellular phones to make and receive cellular calls with the ease and comfort of a home phone system. My absolute favorite feature (besides not having dropped calls anymore or bad reception) is the hands free headset it comes with. With a fussy baby and two busy kids, this mama has NO time to sit and talk on the phone, let alone hold one in my hand while trying to get everything else done. So the cordless headset is my favorite feature!!! LOVE. All we have had in this home, for a while now, is VTech phones. We love them, always have and I am very happy with this new phone I was able to review. Thanks VTech!!!! You can purchase this online at http://www.vtechphones.com. It retails for $99.99 and is worth every penny! Originally published on 2013-07-25 by Kim at Shop with Me Mama .